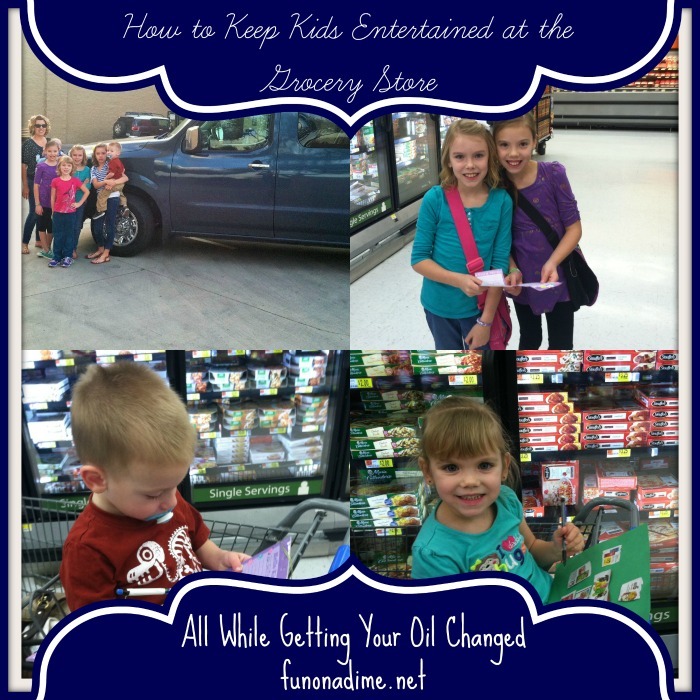 You are here: Home / Blog / How to Entertain Kids of All Ages at the Grocery Store and get your Oil Changed TOO! There are some errands that I just hate to do. Getting my oil changed in my car has to rank right up there in the top two! It just always seems like such a waste of time even though I know it needs to be done. I recently learned something brilliant that I had to share with all of you! We all know moms are the Queen multi-taskers and I just found another way for us all to continue in our reign!! You can get your oil changed while you grocery shop. WHAT, I know mind blown! I really don’t know how I didn’t know this before. I do all of my grocery shopping at WalMart because it is my closest grocery store and I love price matching but I never paid attention to the car department. My gigantic car and crazy crew dropped off our car before our shopping trip. If you look close I am missing my preschooler who fell asleep on the way and 5 more minutes of sleep won over a picture. 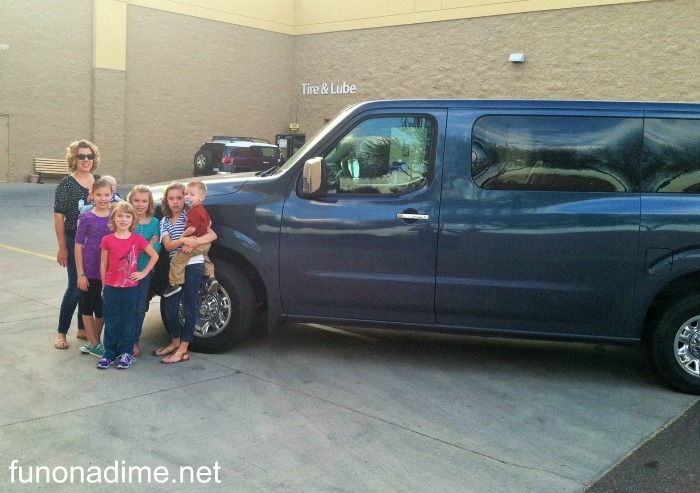 Now that our car is safely in the hands of the Automotive Care Center getting its oil changed with Pennzoil oil it is time to tackle grocery shopping with kids in tow. I know lots of people that are always complaining about taking their kids grocery shopping with them but I can solve your woes right here! Check out these fun ways to get your kids involved with the shopping and it will be a fun experience from now on. I always put my infants in a moby wrap (any carrier will do that’s just my favorite) when in a grocery store. There carseat doesn’t take up room in the cart and they tend to be way happier. A fussy baby while grocery shopping is no fun. My toddlers always want to play with my list that I am holding and it is a little difficult to shop when you r toddler is eating or ripping up your grocery list so here is my genius idea!! I give them their own pad of paper and a pencil. My next suggestion is to save you from having to bend over and pick up said pencil 50 times while grocery shopping; duct tape the pencil to some ribbon or yarn and then duct tape it to the bottom of the pad of paper. He had a blast playing with I and he didn’t bug any of us once for our lists!! I have my preschooler before we go take a grocery ad and cut out things she likes and glue them to a piece of construction paper (great fine motor activity). 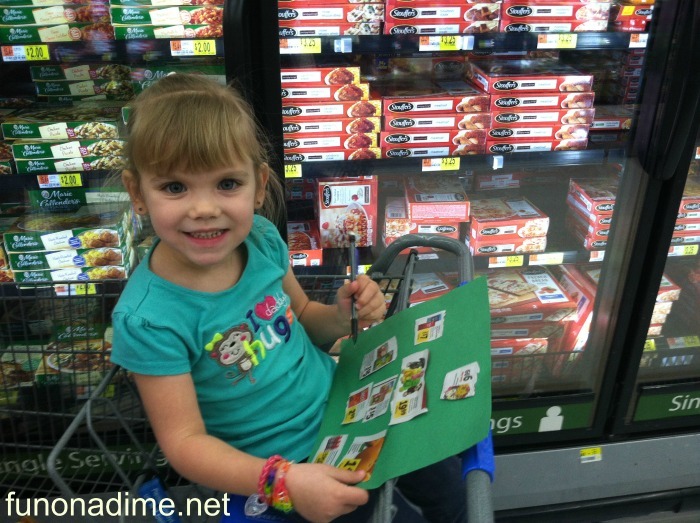 When we are at the grocery store she looks for the things she cut out; kinda like a scavenger hunt. Warning: the first time I did this she was extremely disappointed when she didn’t get to buy all the things on her list so hopefully you explain better than I did the first time. LOL Now it is great fun though and totally entertains her the whole time we are there. 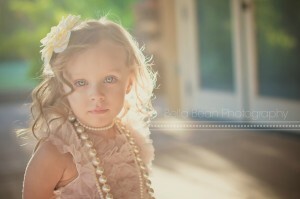 Kids this age tend to have a lot of energy so they are my runners. The get to take the stuff off the shelves that they can reach and put it in the cart. They get to go get the produce bags etc. My 6 year old loves it and it makes her feel so important because she has a job. 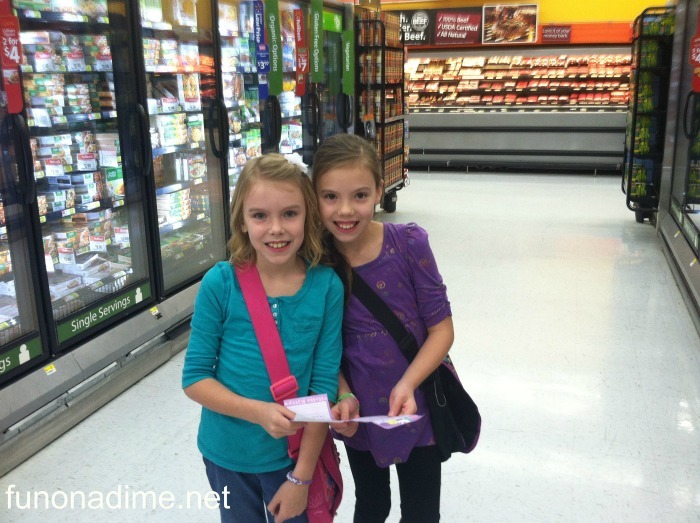 These kiddos are in charge of the grocery list. 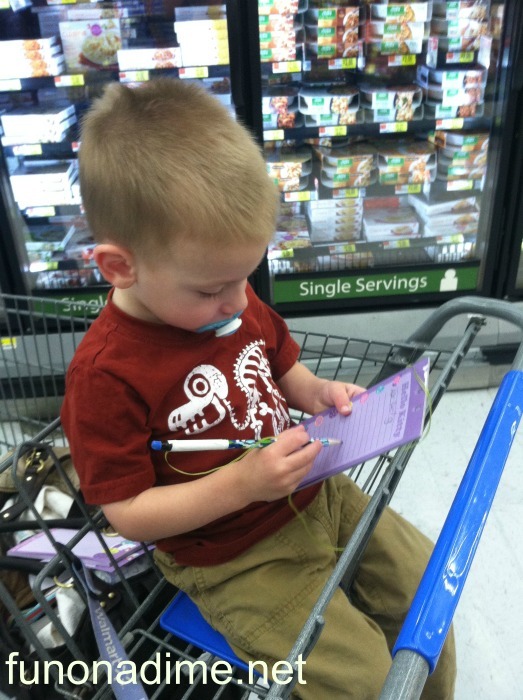 I have two kiddos this age so we split our list in two so they both have something to do. Of course then they wanted to know why you could buy the oil if you went somewhere to have you oil changed so we explained how some people do it themselves at their houses. I am pretty sure we will be doing that soon so they can learn all about that next. You can grab a great coupon here if you are brave enough to do your own at home! Check out the giveaway Pennzoil is doing right now too. Pennzoil Richard Petty Driving School “Experience of a Lifetime” Giveaway Sounds like lots of FUN!!! 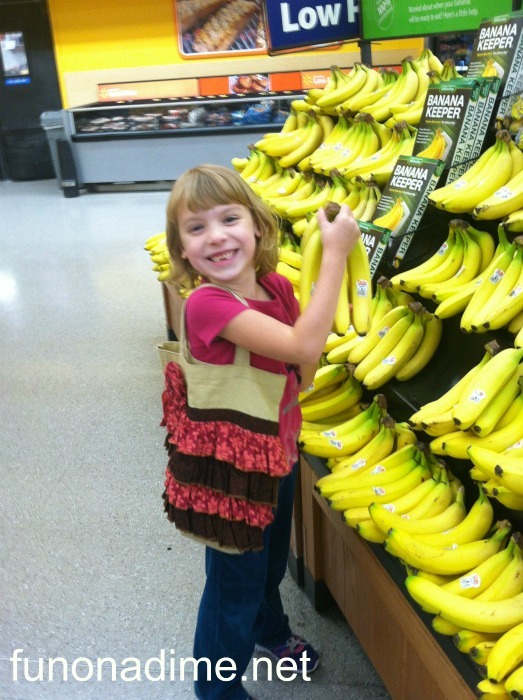 What do you do to keep your kids entertained at the grocery store? I would love to hear your ideas!